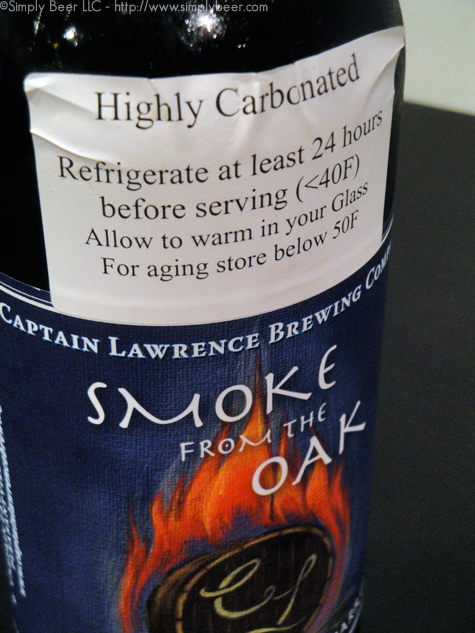 On May 8th Captain Lawrence released Smoke from the Oak through their brewery, but lucky me, it was after I went dry for the month of May. Did that stop me from getting to the brewery to get my allotment of this beer? HELL NO! The marriage of beer and oak is a truly wonderful thing. Just like wine, whiskey or rum, beer can also gain in complexity when aged in oak barrels. But if you take it one step further and age the beer in oak barrels that had previously held world class wine, well then you can elevate the experience even higher. 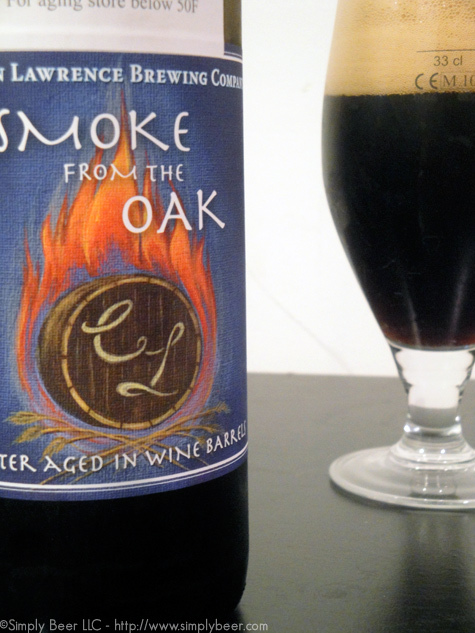 This is our Smoked Porter, aged in French oak barrels that were previously used to age Merlot and Pinot Noir. We let the beer age in the barrels for around 12 months before adding a fresh dose of yeast to allow the beer to naturally carbonate in the bottle. Enjoy in a wine glass or snifter Smokey and roasty aromas are mixed with aromas of dark fruit, chocolate and a vinous character. A small hint of vanilla slowly creeps in towards the end. The flavor is smooth as silk, with layers of sweet malt, oak and roasted malts. As the label says, highly carbonated, pours a gigantic thick and very stable head. The beer is a very dark brown with nice crimson highlights. I knew it was a porter going in, but I was still not expecting the color with the aroma. Absolutely beautiful! It smells like wine barrels, straight up wine barrels. Very sweet grape juice aroma with hints of lemon. But, don’t let that sweet grape aroma fool you, you can tell there is something lurking behind the aroma in this porter. There is this subtle funk that dances around the edge of the sweetness daring you to dive in. Wow there is a lot going on in this beer, I’m not sure where to start. My first though is, this beer needs more time in the bottle to let the flavors blend some. 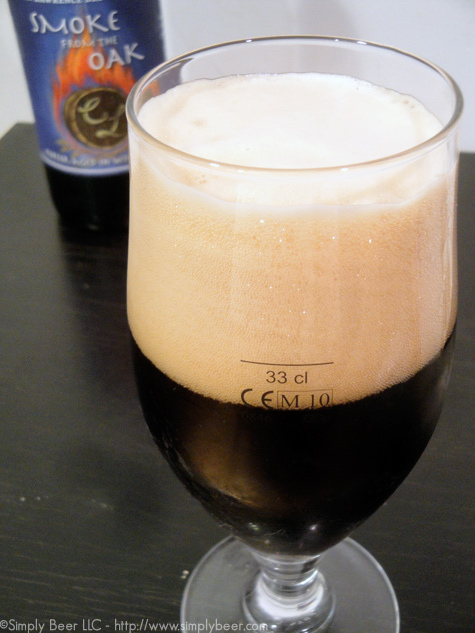 The base beer is a porter, and there is a good amount of roasted malt and smoke under the beer. I think what gets me at first is the sweetness mixed with a touch of sour that keeps butting heads with the roasted malts. There is a quite a bit of smokiness to this beer mixing with all the other extreme flavors… All I can say is this beer is playing games with my tastebuds. I’m not finding this an easy drinking beer, but with so many sharp, strong flavors that seem to be competing with each other, makes it an adventure. However, I’m looking forward to trying another one in a year or so. I think with a bit of age this beer will mellow and even out a bit. Peter, looks like this was an interesting brew to come off the wagon with. So how the the Karate go? I was expecting a post about that. Also this looks good. Lots going on sounds very intriguing. I wish we could get this out here. And no I’m not going to buy one on e-bay! Good to have you back! Next story Which is better Ranger IPA or Ranger IPA?